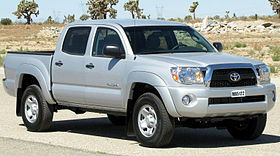 The Toyota Tacoma is a pickup truck manufactured in the U.S. by the Japanese automobile manufacturer Toyota since 1995. The first generation Tacoma, model years 1995½ through 2004, was classified as a compact pickup. The second generation was classified as mid-size. The Tacoma was Motor Trend Magazine’s Truck of the Year for 2005. The Tacoma was introduced in the US in 1995 as a replacement for the Hilux, which prior to this was marketed in the US under the name Toyota Pickup. Compared with the Hilux, the Tacoma is engineered with a greater priority on ride quality, handling, comfort, and safety over ruggedness and payload capacity. The design is intended to better suit the needs of the US and Canadian pickup truck market, where pickup trucks, particularly compact and mid-sized models, are often used as personal vehicles, and less exclusively for commercial, agricultural, and off road use. 3.4 L V6 rated at 190 hp (142 kW) and 220 lb·ft (298 N·m) of torque. The 2.4 L gave a highly useful 29 miles per US gallon (8.1 L/100 km; 35 mpg-imp) (hwy), the 2.7 L gave 26 miles per US gallon (9.0 L/100 km; 31 mpg-imp) (hwy), and the 3.4 L delivered 22 miles per US gallon (11 L/100 km; 26 mpg-imp) (hwy). Two-wheel drive Tacomas had 5-stud wheel lug patterns. The 2.4 L and 3.4 L engines were available in this vehicle depending on options. Automatic and manual transmissions were available. Four-wheel drive Tacomas had six-stud wheel lug patterns, which had been used on the prior pickups (pre-Tacoma trucks). The truck’s frame is fully boxed until immediately after the front leaf spring mount bracket where it transitions into a c-frame section. The 3.4 V6’s manual transmission was an R150F while the automatic transmission was an A340F (Aisin code is 30-40LE). From 95-97 Single cab Tacomas had the option of a manual transmission with the 3.4 V6 engine. The factory supercharged 3.4L V6 produced 254 bhp (189 kW) and 270 lb·ft (366 N·m). From 1998 on, the single cabs only got a 2.7 L or a 2.4 L four-cylinder from the factory. TRD packages started in 1998 (if the V6 engine was selected, a differential locker in the rear came with it). Prerunner models started in 1998. They share the same front and rear suspension parts and geometry, frame, styling and engine options as the 4×4 Tacomas of this year range. Prerunner Tacomas also had the option of the TRD Off-Road package which (like the 4×4) got a rear differential locker if it was a V6 model (among other suspension variations). One downside is there was no option of a five-speed transmission. The V6 Tacoma automatic transmissions were an A340E. Because of the similarities in the Prerunner and 4×4 models, it is possible to use stock parts to convert a Prerunner to a 4×4.